Casablanca is changing. It has always been the business capital and is Morocco’s largest city providing 48 per cent of the urban jobs in Morocco. It had the reputation of being run down and polluted but things are changing. The newest addition is Casablanca’s new tramway system a radical change in urban transport policy which links the centre with some of the suburbs . It was inaugurated by King Mohammed VI with French Prime Minister Jean- Marc Ayrault. There is now an alternative to Casablanca’s red petit taxis and the traffic jams in the city centre. The city was always the driving commercial force during the French Protectorate from 1912-1956 with its port which is still one of the largest in Africa. It has superb architectural heritage of Art Deco and Mauresque (Moorish architecture) developed in the 1920’s and 1930’s which has been sadly neglected but now restoration efforts are gathering force and there is an annual conference dedicated to preserving Casablanca’s heritage. 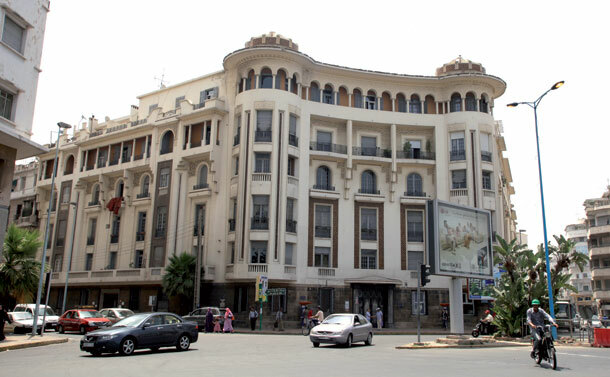 Like Tunis and Cairo, Casablanca reflects the energy and aspirations of the early 20th century colonial period and many architectural gems survive in the city, though not always in good condition. 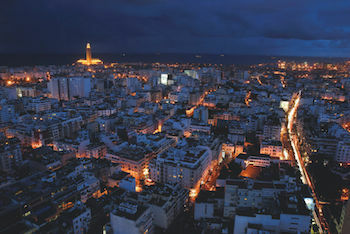 Place Mohammed V was the centre of the French colonial era period development. 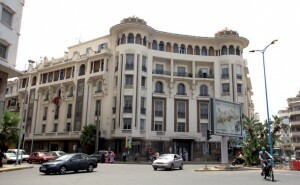 Impressive facades and colonial buildings line Rue Indriss Lahrizi, Rue Tahar Sebti and the south side of Boulevard Mohammed V. Place 16 Novembre is home to an array of Art Deco buildings. There are also many interesting façades with decorative doorways and ironwork on the pedestrian walk way Rue Prince Moulay Abdellah (there are good quality shirts and shoes on offer here.) Hotel Guynemer, (named after the First World War French air ace) with its Art Deco panelling, is worth checking out, as is the beautifully-restored Hotel Transatlantique. The writer and novelist Tahir Shah who moved to Casablanca and wrote “The Caliph’s House” about restoring a former palace which is now his home, is an expert and enthusiast of the historic architectural street remains and daily life of Casablanca which he has chronicled on a number of You tube films and in many travel articles. A particular favourite is the Petit Poucet Restaurant on Boulevard Mohammed V where Saint-Exupéry, the French author and aviator, used to spend time between mail flights across the Sahara. His doodles and letters are hung on the walls. There are the magnificent administrative buildings of the current Place Mohammed V such as the Post Office built in 1918 by Adrien Laforgue, the consulate of France built in 1922 by Albert Laprade, the Palace of Justice completed in 1923 by Joseph Marrast and the Wilaya (Governate) constructed between 1928 and 1936 by Marius Boyer. The imposing and vast Hassan II Mosque stretches over the sea and took 6,000 traditional Moroccan artisans, five years to build . It is one of the wonders of the Islamic world and non muslims can visit on conducted tours to some parts of the building. It has intricate mosaics, stone and marble floors and columns, sculpted plaster moldings, carved and painted wood ceilings. It’s the largest mosque in the world, with room for more than 100,000 worshipers. A new shopping attraction is the huge Morocco Mall which opened last year and is the biggest shopping Mall on the African continent with the full range of designer brands, cinemas ,restaurants and an aquarium. A day out for the family. Casablanca’s medina is also undergoing renovation and it is a place where shoppers can pick up bargains and move on to the more modern Habous market. The Marche Central for fruit and vegetables is also an enchanting period piece worth visiting. The beaches and clubs along the Corniche Ain Dab are great for relaxing by the sea and there are many swimming pools. Although Casablanca is a bustling metropolis with industrial areas it also has the Corniche for rest and relaxation. Casablanca has a vibrant night life, unlike Morocco’s other main cities and the night clubs abound and restaurants such as A Ma Bretagne on the Corniche with superb fish dishes are matched in town with excellent restaurants including Rick’s cafe modeled on Rick’s Café in the 1942 film “Casablanca.” Le Rouget de l’Isle also comes highly recommended. Infact, as with any international city the full range of cuisines is available and the city revels in its role as an international airport hub. The city has a thriving cultural life and it is well worth visiting the some of the 20 or so art galleries to experience modern contemporary Moroccan painting and sculpture which is thriving and internationally famous. 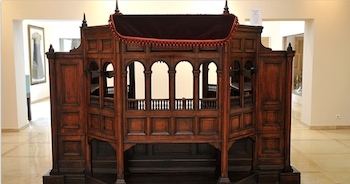 The galleries include Villa des Arts de Casablanca , Galerie Venise Cardre and Galerie l’Atelier 21 amongst others. 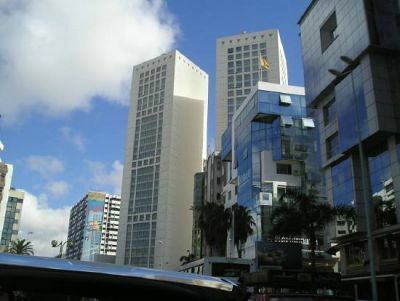 As with any international city Casablanca has its run down areas but it also has chic modern areas like Anfa and towering new office blocks and skyscrapers like the Twin Centre Towers . It is an exciting vibrant city shaking off its old tired image with new developments and offering the tourist a new range of stimulating activities. 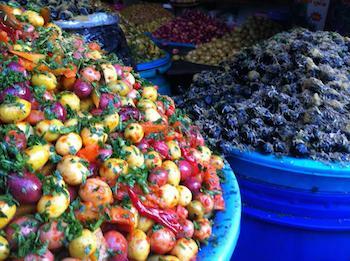 The days when Casablanca was just a stop off point in Morocco to go elsewhere are over.